You will find very few Chinese who do not like sweet potatoes, baishu ‘white tuber’ in Chinese. Story has it that the first sweet potato plant was smuggled into China from what was then Dutch colony of Formosa, now known as Taiwan. A sailor had stripped off its leaves and secretly woven the vine into the hessian ropes on board the ship. It first took root in Fujian province, the mainland province closest Taiwan island. Here, it flourished in the rocky, mountainous terrain where it helped to fill stomachs in a land too poor for paddy planting. Taiwanese like to cook sweet potatoes in rice porridge, and the people of Fujian took over that habit too. However, the sweet potato never grew into a real staple food in the sense that it completely replaced rice or wheat based staples used in the various cuisines of China. Apart from using it in rice and porridge, Chinese turned it into noodles, cooked it in sweet soups and made pies, dumplings, bread and cakes and little snacks from sweet potatoes. Some ‘rustic’ restaurants, like Culiang Renjia ‘Home of Coarse Staples’, currently very popular in Beijing, serve a basket with a variation of rough staples as a rustic alternative for steamed rice or noodles. The basket includes purple yams, sweet and glutinous corn, Chinese yam, burdock and edamame, green soybeans, and . . . sweet potatoes. I don’t think that Chinese peasants ever used to have such baskets on their dinner tables, but it does give you more fibre and is more filling that steamed rice. Sweet potatoes were also eaten as a snack. 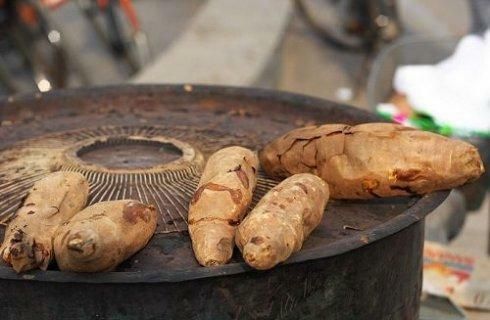 A typical street food in the cold North China winters is a sweet potato baked on a metal barrel. Nothing chases the winter chills away better than a piping hot sweet potato in your hands, skin slightly burned and dotted with droplets of caramelized juices. Slices of sweet potato are dried in the open air, so they can be eaten as a between meal snack in the office, or during a long train ride. Sweet potato slices are no also available as packed food in the supermarket. Other processed sweet potato products include hard grey glass noodles (for more on those see the posts on millet and lotus) that cook down to a translucent white that is much loved in winter hotpots. 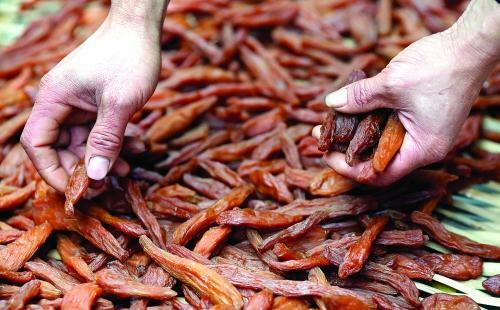 Sweet potato starch is a necessary ingredient in many desserts, as well as the secret to the signature oyster omelette famous in Fuzhou and the region of Chaoshan in Guangdong. In recent years, an unexpected health fad – sweet potato leaves – has risen, thanks to the mighty webchat groups of consumers who consider themselves nutrition experts. In fact, in earlier years, poor peasants used sweet potato leaves as a cheap vegetable, but that may not be known by those amateur nutritionists. After harvesting, the leaves must be thoroughly washed to get rid of grit, since they grow low on the ground. Then the fibres must be stripped off the long stems, starting from the base of the leaf. It is a fussy, tedious task, but necessary. Otherwise, the leaves will be too stringy to eat. 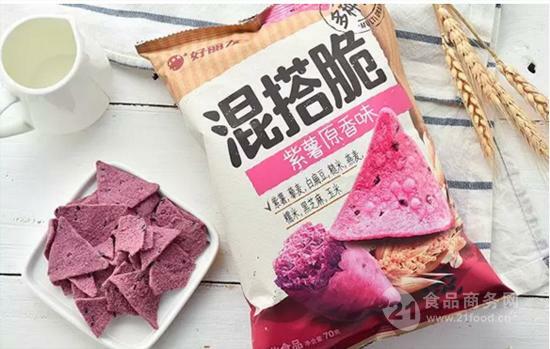 In 2018, Korean confectionery and convenience foods producer Orion has launched a new type of sweet potato chips in China with a purple colour as distinctive feature. There are already companies specialising in processing sweet potatoes. A noted one of Tianyu Tuber in Zhengzhou, Henan province. Tianyu was founded in 1993 and has grown into a company with 760 employees and four subsidiaries. The company also operates the Tianyu Sweet Potato Research Institute and the Henan Sweet Potato Starch Research Institute and helps cultivate a sweet potato test field for the China Agricultural University. This clearly indicates that Tianyu is well embedded at local, regional and national levels. Tianyu has a storage capacity for 50,000 mt of sweet potatoes p.a. and production capacity for 80,000 mt of sweet potato starch, 50,000 mt of various products (noodles, glass noodles), 10,000 mt of sweet potato drinks, and 2000 mt of sweet potato snacks. The company exports its products to 20 countries, including: South Korea, Japan, USA, Canada, Australia and New Zealand.